A buyer needs to evaluate the capacity of a supplier to fulfill his requirements. It is part of his responsibility. To do so he can perform an audit or an inspection. Most of us have difficulty to discriminate them therefore today we will illustrate the difference between audit and inspection. A buyer should learn about its supplier or potential supplier. To do so, he can examine the quality management system, check the factory and its manufactured goods� quality. Additionally, he could consider criteria such as: safety, environmental protection or corporate social responsibility. It may surprise most of us but for all those purpose an audit or an inspection can be performed. An inspection is generally made of closed questions. The answer options are �yes� or �no�. Its role is to evaluate closely a product or a facility based on specific requirements, design� To do so, the inspector needs a plan and a check-list (this is the case for formal inspections only). The inspector evaluates the building. It includes checking the fire tenders, exit doors, etc. 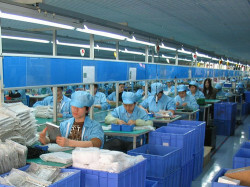 The inspector will evaluate the quality of the produced goods. During a pre-shipment inspection, the quality controller picks a sample (following the AQL table) or the complete batch depending on the client�s requirements. Then he checks the products� appearance and specifications, including some other special requirements from the client, and test them. The audit examines the factory processes and performance based on standards & specific guidelines. It is like doing a survey: a neutral point of view. The objective is to identify the compliance & non-compliance to some specifications, standards, contractual agreements or other criteria. An audit is made of observation. It inspects the equipment and processes based on the written procedures. To ensure the reality is in line with the �theory� (written procedures) it is quite common to interview employees about their working procedures. Audits important output is the non-conformity list (minor and major). It allows to define action plans to improve the implemented system. Audits can be internal or external. It is based on the ISO 9001 standard and focuses on a supplier�s Quality management system: factory, service company, etc. The auditor checks the documented procedures, forms and processes implemented. And most importantly, it looks for records: proves of the processes� implementation. And you: do you have any other explanation to understand the difference between audit and inspection?